April 2nd is General Municipal Election Day and many mid-Missourians will head to the polls to vote for city council members, school board members, mayors and some areas like Southern Boone, Cole County and Fayette will vote on a few different proposals. Here on Exam, we have spoke with the three candidates running for Columbia Public School's Board of Education: Della Streaty-Wilhoit, Blake Willoughby and Jay Atkins. On today’s episode, we are going to recap those conversations. Ardella Streaty-Wilhoit, or more commonly known as Della, is passionate about educating youth. She describes herself as a family woman first and candidate for the Columbia Public School’s Board of Education second. “I got up one morning, and I just simply told my husband, you know, I think I will file for school board,” Streaty-Wilhoit said. Her shoulders shook as she laughed about the out-of-the-blue assertion. Streaty-Wilhoit grew up in a household of 12. Her parents instilled in her and her siblings that education is wealth, and there are no shortcuts. Streaty-Wilhoit took this advice seriously. She earned her PhD in Food and Natural Resources at MU at 50 years old. MU graduate student Marlee Baldridge did not major in science, she does not have any scientific background nor did she ever participate in lab work. Baldridge, though, spent her fall as an intern for NASA Goddard Space Flight Center. Even with a lack of professional science training, Baldridge’s main job as a NASA communicator was to take the science the scientists researched and translate it for the general public to understand. The last time Joseph Johnson was a free man, the world was different. It was 1994 – Bill Clinton was president, Michael Jordan was playing baseball, and The Lion King was the year’s highest-grossing movie. It’s been three years since the nation watched student activist group Concerned Student 1950 protest structural racism at the University of Missouri. Many of the issues spotlighted then, such as MU’s perceived reluctance to acknowledge the history and contributions of people of color, still persist today. This can be traumatizing and invalidating for the 17 percent of non-white students on campus, especially when the modes of racism are invisible to their white peers. But two MU psychology doctoral candidates, Yoanna McDowell and Jonathan Ferguson, are working to alleviate that stress. KBIA's Kathryn Palmer spoke with Ferguson and McDowell about how the Healing from Racial Injustices support group they co-lead helps MU's students of color deal with race-related trauma on the predominately white campus. Columbia’s classical music scene is growing and thriving, thanks to Missouri Symphony director Kirk Trevor. But Trevor’s work doesn’t stop with professional musicians. On a Monday night at Broadway Christian Church in Columbia, Kirk Trevor conducts an orchestra of about 30 elementary and middle school students. He is joined by two symphony member coaches and a handful of parents, eager to listen to their children play. The students are practicing for their next performance in two weeks. Two weeks ago, the Missouri state Legislature passed House Bill 3, which will create new policies to promote STEM education across the state. STEM is an acronym for science, technology, engineering and math. According to the Pew Research Center, STEM careers are some of the fastest-growing jobs in the country. Since 1990, employment in STEM occupations has grown 79 percent. But in Missouri, there’s a supply problem. The University of Missouri conducted a campus climate survey about a year after the resignations of former MU Chancellor R. Bowen Loftin and former UM System President Tim Wolfe. Faculty, staff and students at the Columbia campus were asked questions about their experiences with discrimination, support from campus administration and overall work and study environment. Nearly ten thousand people responded. The results suggested a lack of institutional support for students and employees, especially hourly staff. At a town hall held in mid-September to discuss the survey, MU Chancellor Alexander Cartwright said that the sub-par findings were not unexpected. EXAM: Is Charter School Expansion Still Possible in Missouri? A Missouri House bill that looked to expand charter school options across the state didn't make it through the Senate in May, but the issue of expanding charter schools in Missouri could return in future legislative sessions. Right now, charter schools are allowed only in Kansas City, St. Louis, and under limited conditions in other parts of the state. Missouri House Bill 634 aimed to change that. It passed the House, but didn’t make it out of committee and to a vote before the Missouri Senate adjourned. Legislators are free to pick up the issue again next session. 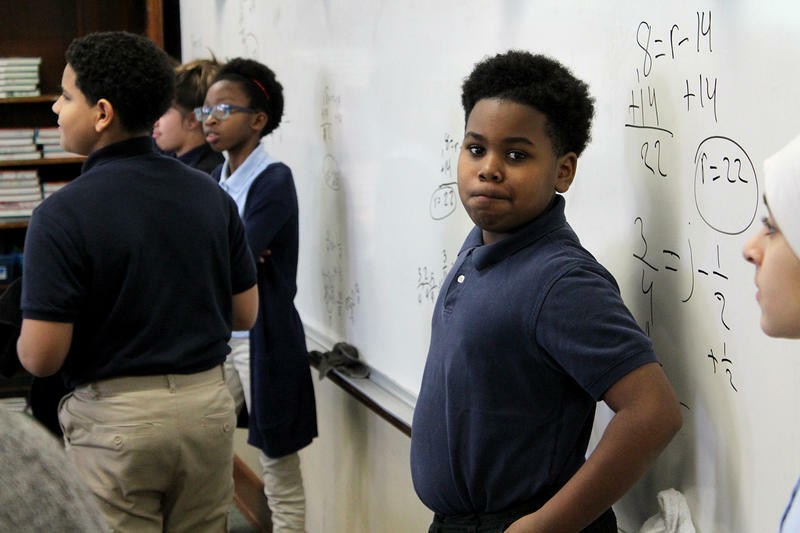 Updated on Tuesday, January 10: The State Board of Education officially granted St. Louis Public Schools full accreditation, a key milestone for a district that's improved after years of struggle. The state board gave unanimous approval to upgrade St. Louis Public Schools’ status from provisionally accredited to fully accredited. Officials with the Department of Elementary and Secondary Education cited the district's rising test scores, improved attendance rates and fiscal stability as the reasons for recommending the change. The farms that straddle both Missouri’s Interstate 70 — which connects the state’s two most populous cities, Kansas City in the west and St. Louis in the east — beckon migrant workers in search of a better quality of life. Blues in the Schools celebrated its’ 10th anniversary Saturday, Oct. 1, with a performance in the Stephen’s Lake Park Amphitheatre. The program aims to raise funds to grow awareness of the arts in mid-Missouri. The program’s resident visual artist, Terry Sutton, helped Grant Elementary students from kindergarten to the fifth grade create a mural called “The Blues Tree” at Central Bank of Boone County. It depicts what the last 10 years of the program. The artwork displays early Missouri artists of classical, jazz, and ragtime music like Chuck Berry, Muddy Waters, “Lady Day” Billie Holiday, and T.J. Wheeler, who runs the program.